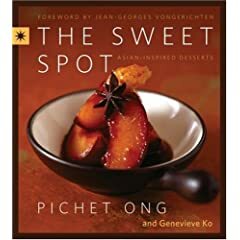 The Sweet Spot: Asian-Inspired Desserts by Pichet Ong and Genevieve Ko might be one or you cupcake lovers to check out (fyi, we haven't seen it yet). "Dragon Devil's Food Cupcakes" smeared with a thick frosting flavored with bourbon, star anise and Lapsang Souchong tea. Cheesecake made of Japanese kabocha squash and a crunchy walnut crust. Icy sherbet made of the queen of Thai fruits, mangosteen. Lemon: Vanilla-bean cake filled with lemon curd. The vanilla buttercream frosting is spiked with lemon zest. Carrot: Shredded Chantenay carrots imported from Canada create a more concentrated flavor. A whipped cream-cheese center flecked with lime zest peeks through the top of the cake, which has a brown-sugar glaze. Vanilla: Vanilla-bean cake frosted with buttercream and topped with an edible flower. Chocolate Dragon Devil's Food: The cake is filled with salted, oolong-tea-infused caramel crème. The chocolate ganache on topped with edible sparkles. Banana: Spiced banana cake with a banana-crème center is topped with buttercream stracciatella made with crushed Valrhona chocolate. Green Tea: Filled with blackberry crème, frosted with matcha buttercream, and topped with shredded coconut. I made the recipe as stated but instead substituted my favourite Iron Goddess tea for the smoky flavours of Lapsang Souchong (and actually using 2 tablespoons of the dried tea leaves), as well as using 1 tablespoon pure vanilla extract with 2 tablespoons water (vs. 3 tablespoons bourbon) in the chocolate icing. 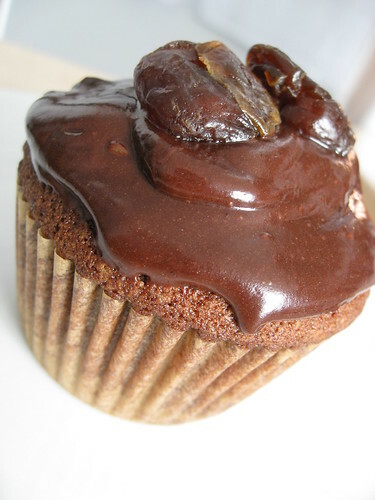 I also topped the cupcake with a pair of dried Rainier cherries. These were also baked in the convection oven for 25 min (vs. 30 min) and had a slightly crisp top/crust (it baked up flat! Yay!). The cupcakes are fluffy and moist, cinnamon spiced and not too sweet; the icing rich, but with a certain "je ne sais quoi." Lastly, click here to see a photo of Batch's coconut raspberry green tea cupcake, which is making me want to hit up Batch as soon as I get back to New York! I've tried a couple of the Cupcakes at Batch and have some photos of the Dragon Devil's Food cupcake, the Vanilla cupcake, the Lemon Lemon Lemon cupcake, and the Green Tea Cupcake in my flickr here:Batch NYC. The Lemon one was beyond delicious. I would go back for just that. I was expecting to love the Dragon Devil's Food Cake, and don't get me wrong, it was good, but just not as special as the Lemon one. I visited when they first opened and they didn't have the Banana or the Carrot cupcake, which both sound delicious. I'd definitely like to try some of the other flavors.